These Broken Stars was one of the best books I've read so far this year and I am filled with love for it. 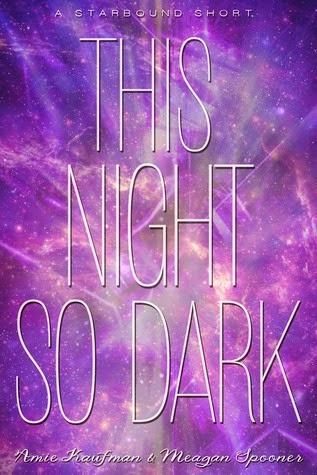 I cannot properly express through words how excited I was when it was announced that This Night So Dark, an e-short story, would be released. MORE TARVER AND LILAC? YES. I developed an emotional attachment to Lilac and Tarver over the course of These Broken Stars and to be able to read about them again in This Night So Dark was amazing. I absolutely love them and to be able to read more into Tarver's past, something that I've always been curious about, was a dream come true. This e-short focuses almost solely on Tarver. Which I thought was well-deserved. Tarver's military past was something that I have been inherently curious about from the beginning. Though it was referenced quite frequently in These Broken Stars, we were never really given any solid details about the events of his time in the Military. We knew that he was a hero, but we didn't exactly know what it was that gave him that status, and more importantly, how damaged we was because of that traumatic experience.Tarver's story wasn't quite what I had anticipated, but I loved it nonetheless. Though this e-short was quite, short, it was pack with intense action and was an incredibly emotional experience. The plot was extremely fast-paced and suspenseful, and had me flipping the pages (or rather tapping my kindle screen) so fast that it probably would have broken. The plot really intensifies evidence we were given in TBS relating to the suspicious activity of LaRoux Industries and I think really sets the scene for whatever is going to take place in This Shattered World. This novella really provided us with insight into the events that really transformed Tarver as a person and as a soldier, and that made him the way he is today (or in TBS), and I absolutely adored that. OH, ALSO: WE CAN'T FORGET ABOUT THE SCENES BETWEEN THE CHAPTERS THOUGH. LILAC AND TARVER TOGETHER. LILAC AND TARVER BEING CUTE. LILAC AND TARVER KISSING. AHHHHHH. Lilac and Tarver. Period. I love them in anything, and though I will miss them in This Shattered World, I am really curious to see just how their stories will entertwine with those of the main characters of the next book, Flynn and Jubilee. This Night So Dark was incredibly fast-paced and intense short story which really provided me with beautiful insight into Tarver's military history and built what I think is a fantastic foundation for the future books, especially in terms of LaRoux Industries' suspicious behaviour. It was wonderful to see two of my favourite characters together again and I can't wait to read the next book in the series. Not too long to go now!